After hearing enough conflicting reviews of On the Waterfront, I decided to put my muddled brain to rest and give it a gander myself. OTW is at the Aman Hotel but each time you enter from a separate side entrance, you are reminded it's not quite a part of it. After the trend of standalone hotel restaurants, Aman too has followed suit and replaced their specialised Spanish restaurant with the ever-popular multi-cuisine restaurant. OTW is brought to you by the people behind one of Delhi's few consistent restaurants, Setz. You know you've hit 5-star luxury, when you walk into a beautiful, well- lit space with glass walls that peek in to serene water pools with theatrically defying flames shooting out of them. The restaurant is vast with a proportionately big island cooking station. A wooden, glass enclosed jetty that temptingly extends in to the water, leads to a semi-private glass room that holds four cozy tables. Suggest you nab this spot if you can. It is this section we had booked and confirmed. And on that note, let the onslaught of bad service begin! To cut a long story short, at arrival we were told that that section is only for walk-ins, and is currently full, which would be fine if it that had been mentioned and the table had not been confirmed. We were seated on two different tables, which we had to vacate because of dripping water from the air-ducts. Finally, we were escorted to the glass room, but to an unforgivingly dirty and unmade table, which took three different people to clean properly. Each complaint was frustratingly met with only clueless unwarranted smiles. Made me want to grab them by the shoulders, shake them violently and shout "what are you smiling about look concerned!" Really made me wonder if they even understood a word we were saying. Bad service is nothing new to the Aman but for god's sake get better not worse! 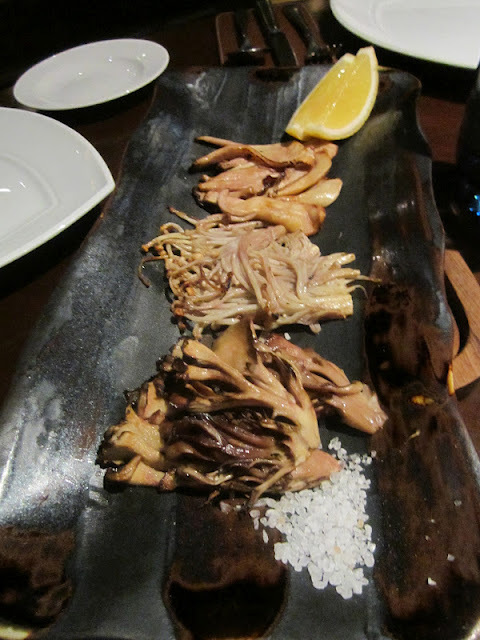 After demolishing two loaves of fresh warm bread - the bread really was special, our first course of Robata Grilled Mixed Mushrooms and a Crispy Seabass with Green Mango Salad arrived. The exotic assortment of Japanese Milky Mushrooms, Enoki and Maitake were a delight. Very simply and rightfully grilled with butter and wine, served with a wedge of lime and rock salt that needs to be used sparingly to avoid taking away from the wonderfully sweet flavours of the mushrooms. Highly recommended unless you have some strange aversion to mushrooms - in that case - Im sorry for your loss. The salad served was somewhat deconstructed. A bowl with a chunky wedge-cut mango salad and a paper cone with western styled bread crumbed fish. This melange of east and west and play on fish and chips could have been clever IF a light golden batter had coated moist and flaky fish. Instead, you are painfully met with a dry bread crumb exterior, which by no surprise, takes over the unforgivably under-seasoned fish. 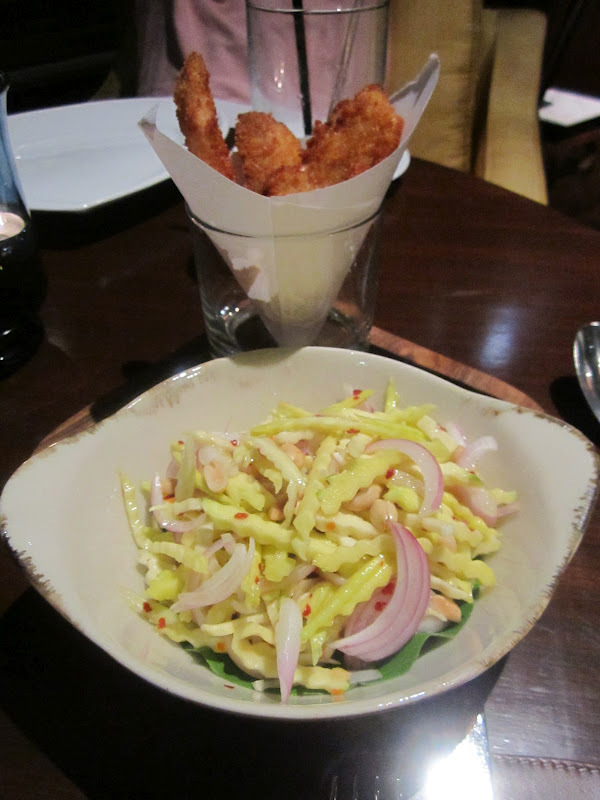 That, awkwardly head butts with the lighter more zingy raw mango salad. This certainly is one of those cases of failed innovation . To kill time we munched on some yellowtail sushi. The yellowtail was fresh and almost creamy. However, the clumpy over cooked rice made the sushi lack the finesse it deserved. And yes the sushi is in all different sizes - clearly no sushi "master" here. We were then brought the wrong kale dish, which is forgivable till it's followed by an inane round of questions of whether we are sure we didn't actually order what was brought. The dumb and dumber saga continued when our other mains were also taken back. 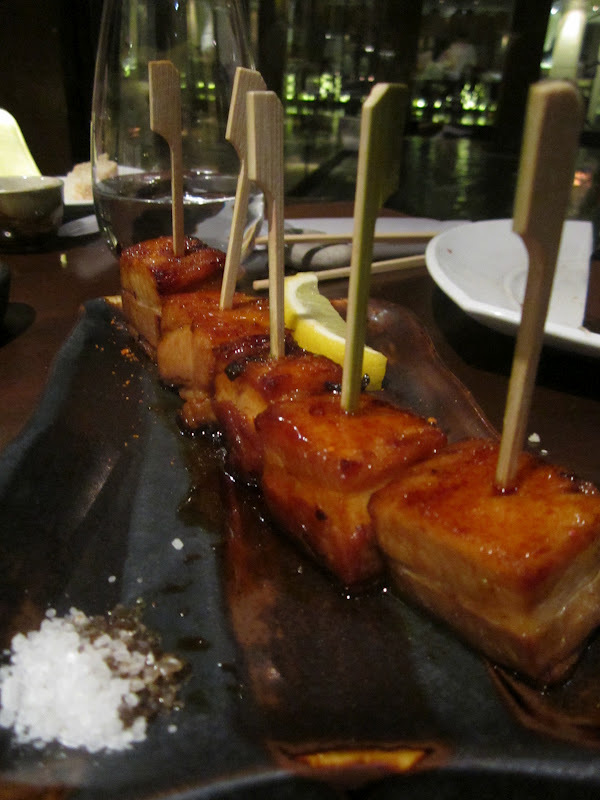 Of course by the time our Robata Grilled Teriyaki Pork Belly had been brought back, it was slightly tough and chewy, no doubt the result of some inexcusable re-heating. However, the sweet slightly stick Teriyaki glaze was nice and the dish may even have been good if it wasn't for this faux pas. Our four Scallops with Granny Smith Apples came cold and dismal. You would think after all this , we would be given a fresh batch. After all, how long does it take to cook scallops! Instead we were handed a humorous plate of two sacrilegiously re-heated scallops, which were under-seasoned with insipid apples that lacked the sweetness they were chosen for. Not to mention by now, our scallops were tough and overcooked - horror of all horrors. The foam added nothing, and the sweet soy sauce was too watered down to be of any value to the dish. On paper this was a winner of a dish but on my plate.. dismal. After throwing off our other two mains, the troublesome Kale dish thankfully compensated. The meaty Milky Mushrooms were juicy and not overburdened by the combination of lemon, chilli, soy, garlic, while the still vibrant Kale beautifully absorbed it all. Wonderful ingredients bettered by uncluttered cooking. Loved it. Still not satisfied we indulged in some spicy Thai veggie fried rice. We were hoping to eat this with the previous dish but that was too good to suffer a wait. The fried rice was fairly standard but tasty. The slightly sticky jasmine rice had a somewhat smoky flavour which I quite enjoyed. The pigs that we are, we also got the Lemon Crab Linguini. The zing from the lemon zest could have been a little more prevalent and the meagre crab meat could certainly have had a greater presence. But otherwise, this classic dish thankfully kept its integrity. Simple comfort food, order it if its what you are on the mood for, otherwise skip and get a little more adventurous. Our sticky date pudding would have fared better if the cake was a little more moist . It certainly wouldn't have hurt if the ice-cream arrived in a clean scoop rather than a melted puddle. However, the butterscotch sauce did make up. Not for the sugar-cautious. Overall, the food doesn't wow but it does satisfy, bordering a spectrum of average to good. A beautiful venue I am not quite ready to give up on either. But it was hard for our meal to not get soured by the lackluster service. The hapless servers can't be blamed entirely because they simply reflected the inadequacy of their training. Standalone or not, you don't expect 2-star service at a 5-star venue. Time for a wake-up call.